There’s a fact you just cannot deny. Food is love! 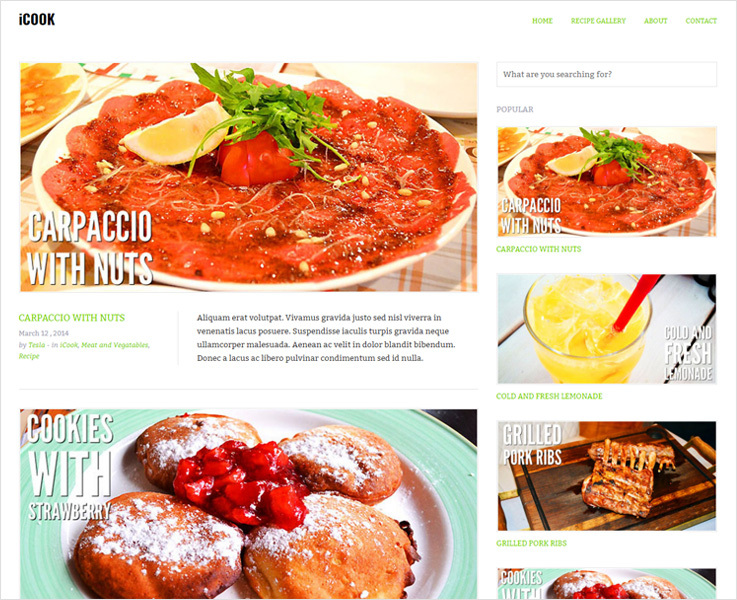 Spread it with some mouthwatering food WordPress themes for your blogs. Let people know how you have got a buffet of your foodie experience. Share your recipes, share your food adventures, create your own food planet online. 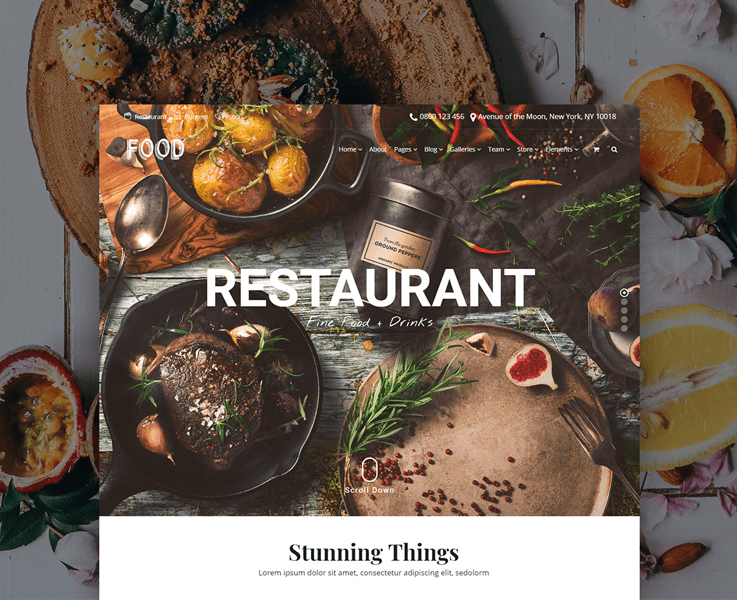 You can do this all with these appetizing food WordPress themes. The key ingredients behind all these themes are crispy looks, responsive designs and a lot of zesty features. Dig in as these 10 best food WordPress themes will fill your needs with a perfect them. Do you want to take your food interest to the world out there? Let FoodRecipe WordPress theme take the charge of it. In this food blog WordPress theme, you can share recipes, food experiences, your food diaries, and all. It is for the foodies by the foodies! Whatever you share, be it your recipe or food experiences, the theme will display it all in an eye-catching way. It has a completely responsive design which is quintessential nowadays. How about we add some more glitters to it? After all, you get numerous predefined color schemes that give a resplendent effect to the theme. SEO optimization helps your website reach the top of the search engine ranking. There’s a lot more to it. Take a glance at the demo to find it yourself! Introduce your culinary skills to the world with iCOOK. On the crisp white background let your food blogs, images, stories do the talking. So, the food freaks around the globe can have salivation while viewing your website. And if not white then iCOOK offers you multiple color styles you can go for. This responsive WordPress theme has got Twitter Bootstrap behind the screen. Social sharing is a matter of clicks with this beautiful theme. Customizing this theme won’t ask for a tech-guy. Anyone can customize this theme according to their taste in a few clicks. With recipe shortcodes, you can highlight recipe, ingredients without any technical codes. Overall, if you want to leave the viewers awestruck with mesmerizing looks, iCOOK is a perfect choice. Extremely easy-to-use and intuitive, but also powerful through its advanced options that allow a professional and unique food site creation without any coding required. Created with the most advanced WordPress technologies. Food WordPress theme supports fluid & responsive layouts so it looks great on all screen sizes. Food WordPress Theme comes with intuitive progress bars wherein you can effectively showcase your food items, certificates, menus, etc in numbers via circular or horizontal bars. Let your visitors slide and see the testimonials they need to. The theme comes with testimonial options that you can smoothly add at any given place of your website. You get several store options like a separate cart for users, checkout page, product pages, ‘My Account’ page and lot more. This will help in better display of your products and in smooth trading. 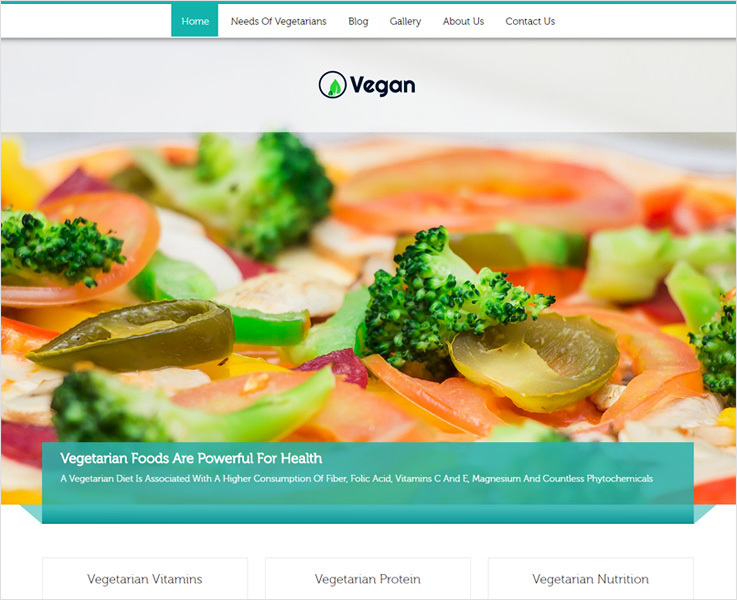 Go vegan and expand your food business in this direction with Vegan Food WordPress theme. For the enticing look, full-screen slider plays the role and this look fits perfectly on every screen. The theme goes easy on eyes with retina ready display. While for better visibility on search engines ranking, it is completely SEO Optimized. Seems like it is perfect for those who want to spread the vegan wave on the online platform. This WordPress template comes with an inbuilt lead capture form. With this form, collect contact information of your customers and reach out to them for future business. CSS and jQuery play their roles behind the screens. Most noteworthy, your website will be free from errors only if it has followed all the web standards. This responsive design template has followed W3C validations to enhance your customer’s experience. Take a step forward and let the delicacies of freshly baked cakes and bread reach to the web platform. Your baked cookies perfectly complement evening tea. 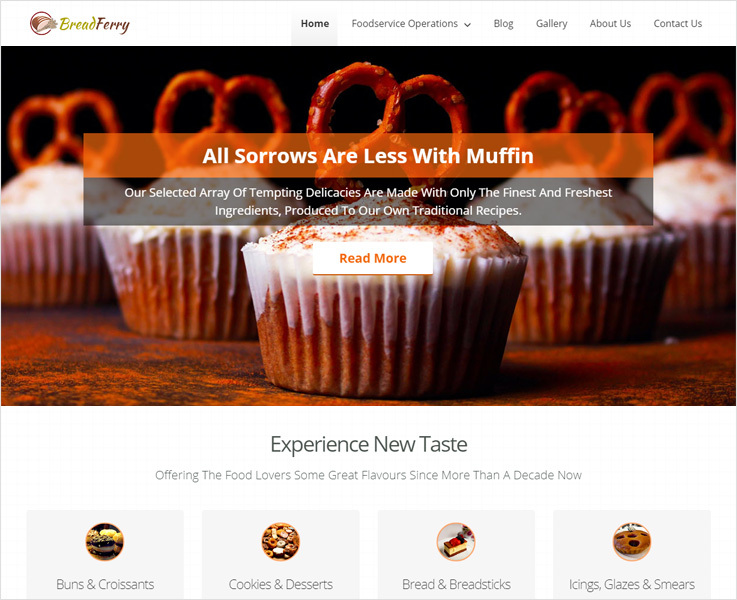 And, we’ve got on of the best WordPress themes for baking that will perfectly complement your bakery business. Bread Ferry is a perfect example of how a bakery WordPress theme should be like. You can show-off images of your cupcakes, your bread on the full-screen slider. Let your customers know more about you with a dedicated video section where you can share videos of your bakery. This responsive WordPress theme is ideal for your bakery website as it nails the look on every screen. It is translation ready with WPML compatible and is retina ready with complete SEO optimization. If you work towards leading people to a healthy lifestyle then we’ve got you a right-hand. 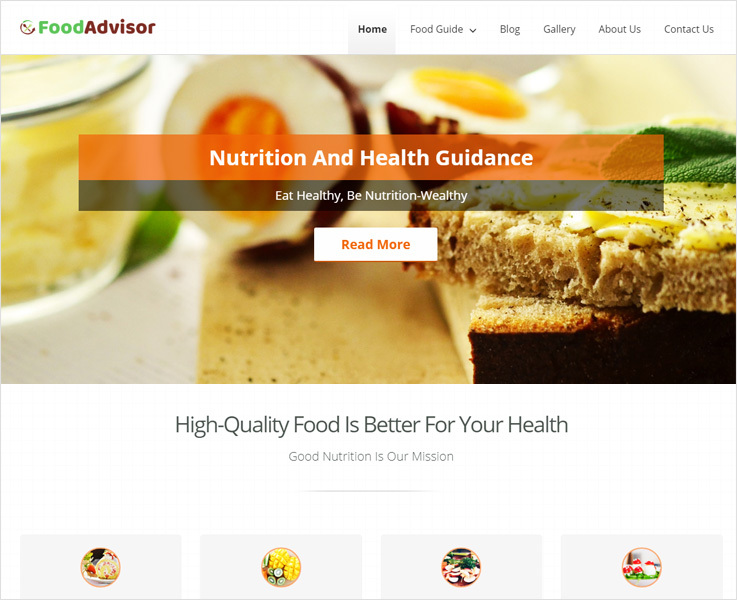 FoodGuide is a responsive WordPress theme with loads of features to serve. Give your visitors a feast for their eyes by adding high-resolution images to the full-screen slider. Furthermore, you can make the appearance more pleasing with flip-flop section. Here you can add images and information in a unique and attention-grabbing way. The retina ready display looks playful and attractive with various animations that come with this theme. It has got crisp typography and Google map integration and supports complete customization. 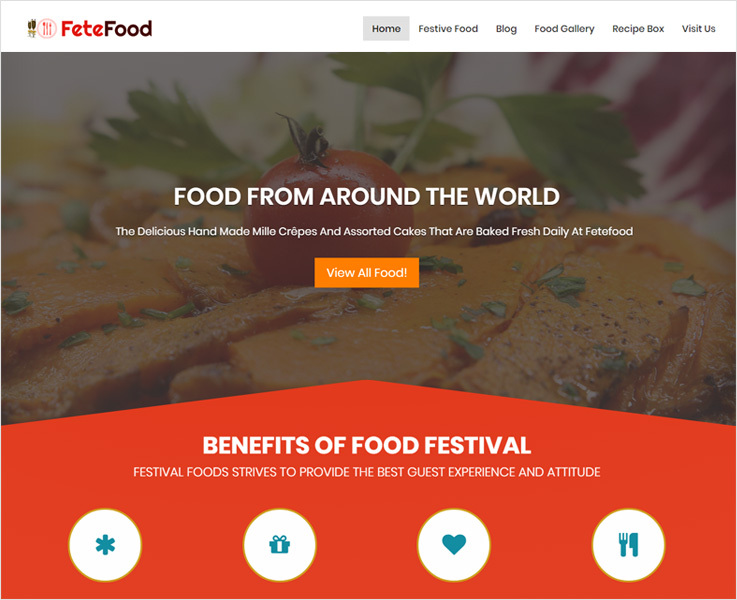 If blogging and food are your must-have’s then FeteFood is ideal for you. The premium theme is aesthetically pleasing with a full-width slider, animations, and the colors! The looks are just amazing! In a glance, you will find the liveliness of this theme and the background design is truly festive. It has got multiple slides where you can display videos or images. Furthermore, you get zig-zag blog design for better visibility and boxed sliders add the attractive factor even more. You get complete customization support so you can add your logo, favicon, banner, etc. A chef puts all his skills to produce a marvelous dish on your plate. 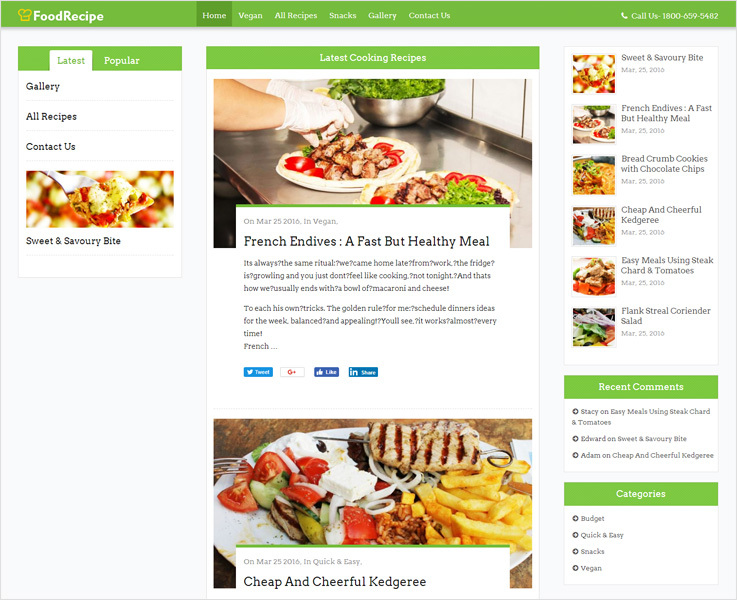 In CookTour, developers must have put all their skills in producing this marvelous theme. 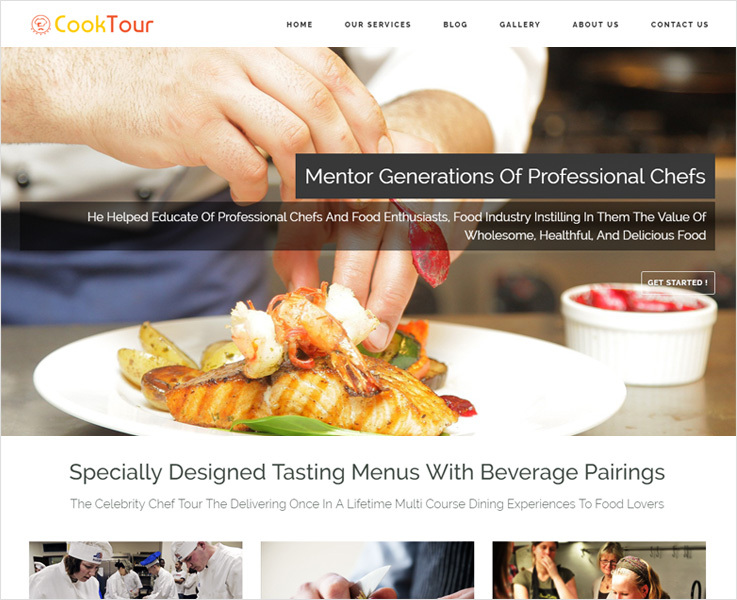 This chef WordPress theme is handcrafted for chefs who want to mark their presence globally. Tempt your visitors by adding some yum images to the full-screen slider of this theme. This responsive design looks great on every device and performs well too. It’s light and doesn’t take much time to load. It is one of those premium WordPress themes you will always thank us for. Powered by social sharing icons this theme is SEO optimized to get better search engine visibility. The retina display has got parallax effects, videos section, blogs section and a lot to make homepage beautiful than ever. 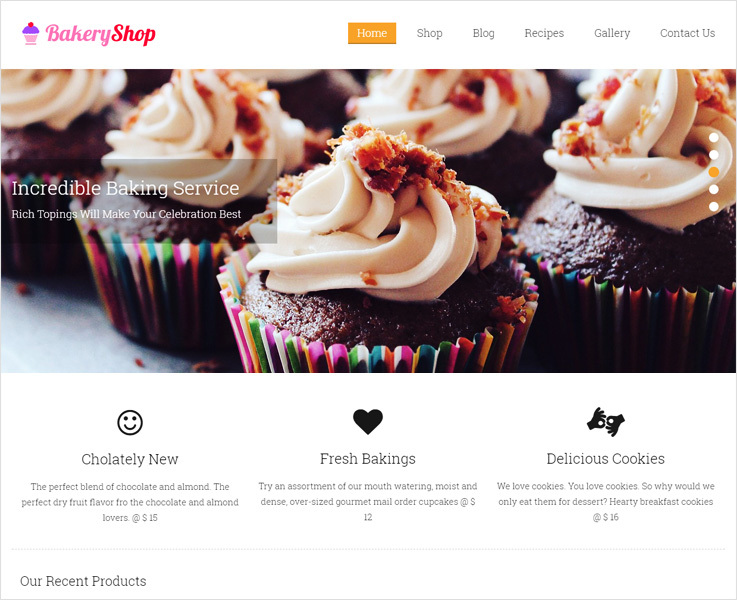 If someone does google search for bakery be on top of that list with BakeryShop WordPress theme. The theme has got a very delightful layout with 5 unique sliders. Here you can showcase images of fluffy baked cakes, fresh bread, cookies, and more. In fact, your customers can order food online as it has got with WooCommerce integration for that. For better online shopping experience, there are options of add-to-cart and check-out too. The Blog section is particularly very attractive, here you can add your experiences, tips, recipes etc. Moreover, for elegant typography, you get a lot of Google fonts integrated. There are numerous color schemes where you can mix match to make your own style statement. This responsive theme has got customization options too and is easy to use and install. 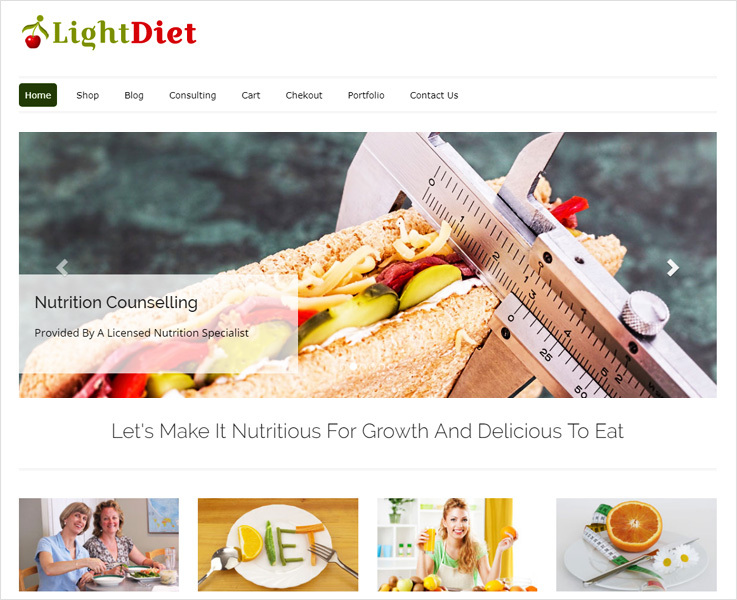 If you want to expand the horizon of your dieting consultancy by taking it online then LightDiet is a theme for you. This WordPress template will give you an astonishing website with tons of features. You can create an online marketplace for your business using this theme. How? This WordPress theme has got WooCommerce and PayPal integration for that. Users can pay through PayPal where their subscription management hassles will resolve too. The retina display has got multiple sliders where you can add images for a crisper look. Furthermore, by nature, this theme supports customization and comes SEO optimized. It is completely responsive and multilingual with all the major social sharing icons. Looking for a website which requires least efforts. Go for ChefKing. ChefKing is a responsive WordPress theme which is designed keeping chefs, caterers and street vendors in mind. This beautiful theme comes with many visually appealing colors. In the slider section, you can add tempting images of food, places and more. It also has a lead generation form through which you can collect leads of your customers. There is also a gallery section dedicated to images that you want to showcase for your customers. It comes with WooCommerce integration so customers can shop through the website and enjoy your yummy food. Moreover, one click for installation and 2 minutes for the setup that’s all you need. And you can have your own customized website. Finally, these were some of the yummiest food WordPress themes you can feast on. Get straight away to your kitchens and start cooking. Let these themes take care of the businesses.